Martin Stephenson…‘Working with GOJO’ MUSIC seemed so easy because primarily, they all love what they are doing, know what they are doing and totally respect / love each other…it was a brotherhood – but make no mistake this is an enlightened band of brothers and that is why I served. “Gary O’Dea – like your best mate with added talent, a singer/songwriter and cracking harp player discovered by Martin Stephenson… and the result is this EP…GOJO’ MUSIC – thank you very much indeed.” Janice Long – BBC Radio WM 2/9/06. “Just what you need for one of those chilled summer night’s, watching the sun go down – works a treat” Loyd Williams Show – BBC Radio WM 29/7/06. ‘Bluesy acoustic swamp rock from the heart of Tipton. Frontman Gary O’Dea and bandmates Garry Oliver, Eric Cox and Andy Stokes recruited former Daintee Martin Stephenson to record and co-produce their four track EP. The songs meander in a satisfying manner, with an undercurrent of old school punk.’ Andy Coleman – Birmingham Evening Mail 8/7/06. 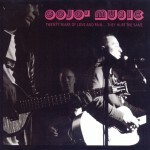 ‘Sporting a mission statement that describes them as a blend of funk, blues, soul and reggae with the attitude of punk, GOJO MUSIC is the latest project from Tipton based singer-songwriter Gary O’Dea. A four track EP produced by Martin Stephenson and featuring the liquid guitar of Garry Oliver, Twenty Years of Love & Pain…they hurt the same marries angry protest and world weary hope. Inspired by the story of the late Afghan freedom fighter Abdul Haq, Tell Me Please, Is This How The West Was Won? is a brooding folk-funk groove questioning America’s involvement and agenda in Afghanistan while (Get Me On A Bus To) Betterville is a bluesy, harp wailing, slow train chugging song about depression, Distant Friend is a gently strummed folk-blues song about a breaking relationship (Stephenson’s influence apparent in the Northern lights ambience) and Time Out a six minute lay back and chill number that name checks both Hoagy Carmichael and Sweethearts of the Rodeo’. Also here’s a link to an interview on the BBC web site regarding the release of the ’20 Years of Love and Pain’ EP. Track List: 1:Tell Me Please, Is This How The West Was Won? 2; Distant Friend. 3: (Get Me On A Bus To ) Betterville. 4: Time Out.